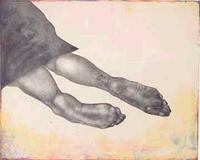 Kiki Smith etchings by Crown Point Press. I picked them up last week, so I'm not sure if they are still available. It would seem people were just buying everything at Art Basel where they were first displayed last week. The first one, which I liked the best, is titled "HOME" and the second is called "STILL" both made in 2006. OK.. so, here's 10 11 of my best rationalizations for buying something I really don't need!! 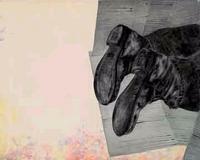 I'm a Kiki Smith Fan, I just Love, LUV, loved her last few books and shows! MOMA, The Walker & SFMOMA..etc..
How can you not like art by someone named KIKI! Watch this cool video of KIKI! OK, So maybe not maybe worth pointing out to everyone. But, hey, what do I know. Plus Crown Point Press does some really great work. Maybe yesterday was a slow art news day and maybe Tyler was too tired or hungover from a wild weekend to write something real, but I was impressed to see Tyler Green writing about a "big" donation of Crown Point Press Prints to the Fine Art Museums of San Francisco (FAMSF).. But he also pointed out something I didn't know (da.. like, no surprise there!! ), but, there is a current small show of Crown Point Press Etchings at the de Young. Thanks Tyler! Nice choice.. I think Kiki Smith is brilliant! Good choice...up to $4000 each now. And attractive, too. I like Crown Point Press, although I'm waiting for another Thiebaud edition. Are you purchases for sale? If so contact me. Thanks!